Chapter 8 of the Traffic Signs Manual sets out the effects of road works or temporary closures on all kinds of road user and recommends steps that should be taken to minimise these effects. With regard to safety barriers, when undertaking work on a public highway obstructions and excavations should be adequately guarded at all times. Barriers may be used to protect all persons from roadside hazards, obstructions/ excavations and/or for the protection of the workforce from an errant vehicle. Traffic barriers for guiding vehicles and indicating that a traffic lane or part of a traffic lane is closed. Lightweight barriers for delineating the inner edge of safety zones. All You Need To Know About Barrier Systems. Whether a barrier is being used to maintain an orderly queue or to stop someone falling down a hole, it is nearly always there to make life easier or safer, but even though most of us come into contact with barriers every day, they’re something that few people ever give any thought to. The British are renowned for their ability to form an orderly queue, so it’s no surprise that barrier systems are found in all types of buildings and venues. By offering suitable queue management systems, customers and visitors can be served quicker and will be less deterred to walk back out of a venue or business because of the length and poor structure of a queue. Another bonus is that when queuing customers can be dealt with at a fast and efficient pace, staff can also operate more effectively. In addition to managing queues, barrier products can be used for a wide range of other purposes, both indoors and outdoors, such as blocking certain areas, highlighting traffic routes and cordoning off hazards. Products available include mobile solutions that can quickly be configured into different layouts, temporary products, and wall mounted systems that house retractable barriers. Many barrier products also utilise additional safety and security features such as anti-tamper ends, preventing accidental release of the webbing, and enhanced ‘topple-angles’ or weighted bases that make them difficult to knock over. Take a look at the following product highlights, which illustrate the main differences between the types of barriers on offer. With the help of the “Your Guide” you can establish which product would be most appropriate for your needs. Temporary and lightweight barriers with webbing which stretches between posts, the material retracts at the touch of a button. Ideal for removing ambiguity as to where the customer should queue. Rope or cord barriers which hook easily onto posts. The ropes come in a range of styles including velour, twisted and braided. Rope barrier systems tend to be more aesthetically pleasing and suited to low traffic areas where space is limited. 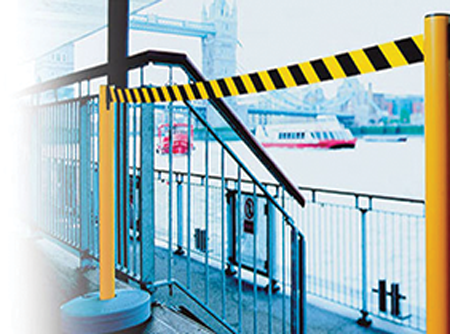 A range of robust and heavy duty barriers suitable for a variety of external or industrial applications including segregation and guidance of personnel. Industrial barriers can consist of hard wearing chains, retractable, high visibility webbing or plastic or steel barrier systems. Can be used both internally and externally, usually as a form of traffic management or security device. They are available in a range of styles from heavy duty cast iron to stainless steel, which are ideal for premises where quality and style are important. Safety barriers are normally used to help warn customers, employees and the general public of potential hazards and promote safety. Any safety barriers put up in public places for temporary roadworks or inspections have to comply with the Street Works Act, Chapter 8. Why use a rope barrier over a retractable barrier? Rope barriers are most often used in areas where there is a requirement for guiding or restricting access but in a more presentable format. Public areas such as theatres, exhibitions, hotel receptions are just a few examples of where rope barriers would be used as a preferred option over retractable barriers. We offer a choice of different rope materials, all of which will create an aesthetically pleasing image for your building or office area. Twisted rope– a premium quality deluxe rope available in 3 colours and a choice of polished chrome, satin chrome or polished brass snap ends. Braided rope– a more economical synthetic option of rope that is very hard wearing and strong. Velour rope– more economical than twisted rope with a soft luxury feel but less hardwearing. Posts– depending on the existing decor, we offer a selection of posts to accommodate the ropes in finishes of satin or polished chrome, brass and stainless steel. For an even more economical version, we offer a metallic PVC post supplied in pairs with a solid plastic base. 4-way connectivity– the Sphere, Contemporary and Classic posts and the budget rope barrier posts come with 4-way loops to allow for multiple rope segregation. Wall plates– can be secured neatly to be used where a rope barrier is required in the same place on regular occasions or where space for a post is limited. Sign holders– designed to be used with the Classic & Contemporary posts and the Economy rope barrier. Retractable barriers are used often for restricting temporary access or guiding for queue management. Post barriers (Indoor) – Where there is a high volume of traffic yet a need for stylish presentation, choose from a range of steel posts in finishes of either glossy mirror effect, chrome or painted steel. Black being the most suitable where trying to avoid scuff marks. Post barriers (Outdoor) – for outdoors and more industrial use we can offer a range of heavy-duty barriers with and option of a solid heavy-duty rubber base or a base that can be weighted by filling with sand or water. Manoeuvrability and space saving – the Rollabarrier allows for easy movement and convenient stacking when not in use. Base design – most of the indoor bases are manufactured to the universal spherical slightly domed style but where space is limited, we offer a slimline base that allows for wheelchair wheels or trolleys to move over easily. The outdoor bases are built more for solidity than presentation. Connectivity – choose from either 2-way or 4-way post connectivity. 4-way allows for segregation in four different directions where required. Webbing – the most popular webbing width is 50mm but where there is a requirement for greater boundary enforcement, the wider 150mm webbing is offered in the Advance barrier and the Indoor/Outdoor barriers. A variety of colours for colour coding or hazard awareness are offered and customised webbing can be provided on request. Safety – The Tensator retractable barriers all come with a slow release retraction mechanism so that the webbing will not cause injuries to fingers when released. The Flexibarriers feature Securiclip guards that prevent accidental or unauthorised release of belt clips. Used for blocking access to openings as opposed to queue or crowd management where posts are more popular. There is also the flexibility of using retractable webbing up to 7.7metres long. Where the use is temporary and there is a requirement for regular movement, the magnetic wall units are ideal especially in warehouses or between steel columns. Barrier posts can be used for additional functionality such as communication with the A4 sign holders or the merchandise bowls that clip securely to the posts.